Erik Spoelstra’s Wife, Nikki Sapp Spoelstra, Is an Innovative Teacher—& Now a Mother! Nikki Sapp Spoelstra and her husband, Erik Spoelstra, became parents for the first time on March 25, 2018, with the arrival of their baby boy. Find out more about the talented and creative lady from South Florida who is married to this NBA coach! 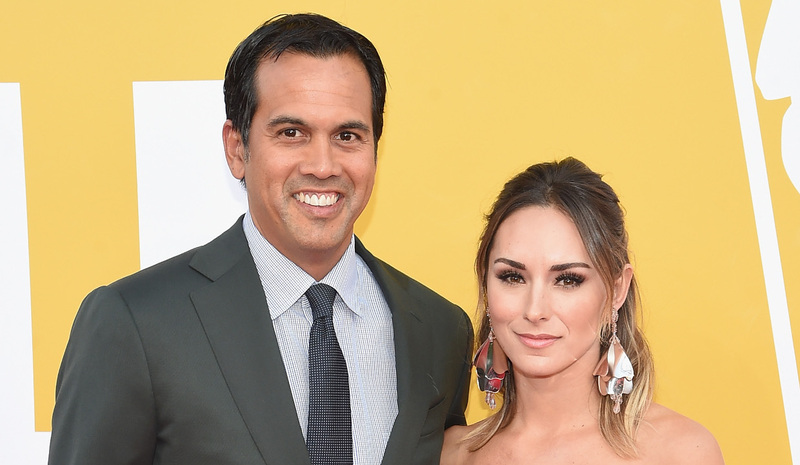 Erik Spoelstra and Nikki Sapp Spoelstra are over the moon as they are now the proud parents of a baby boy, whom they have named Santiago Ray Spoelstra. Erik Spoelstra’s wife, Nikki Sapp Spoelstra, gave birth to a healthy baby on Sunday, March 25, 2018. The couple shared their happiness with everybody by posting a photo of themselves with the baby on Instagram. Erik Spoelstra is an American professional basketball coach and currently the head coach of the Miami Heat of the National Basketball Association (NBA). And now, after the birth of Nikki Sapp Spoelstra’s baby, people want to know more about his beautiful baby mama! We’ve details from Nikki Sapp Spoelstra’s wiki, so keep reading! Born on March 22, 1987, Nikki Sapp Spoelstra’s age is 31. She studied fashion design at the Miami International University of Art & Design and produced her own fashion show in 2005. Thanks to the response she got and the quality of her work, Spoelstra got a full scholarship for her course. Nikki Sapp Spoelstra danced for the Miami Heat for three years from 2005 to 2008 while she earned her Bachelor of Arts in Art History at Florida International University. Spoelstra has a passion for dance. She has taught children between the ages of five and 18 at Just Dance It!, as well as several other prestigious dance studios in South Florida. The former Miami Heat dancer started her career in art by becoming the gallery director for the Guy Hepner Contemporary Art Gallery in Los Angeles, California, in 2010. She was also an occasional guest writer for the American Contemporary Art magazine. In 2011, Spoelstra opened the first Miami art gallery for Guy Hepner located at the Bal Harbor shops. Currently, Nikki Sapp Spoelstra is an educator in South Florida where she teaches Gifted Language Arts to sixth- and seventh-grade students. She is also the head coach of the Sirens Dance Team at the Sports Leadership and Management (SLAM) Academy Charter School. Spoelstra has a strong background in a variety of fields like literature, art history, dance, painting, and design. She uses her skills and knowledge to create an innovative and versatile learning environment for her students. Thanks to her creativity, approach to the learning process, and sheer dedication, Spoelstra was named Teacher-of-the-Year for the 2015-2016 school year. Nikki Sapp Spoelstra is also a clothing designer for her own label, Forever Miss Nik. And that’s not all! Spoelstra is a firm believer in giving back to society and helping others. She is associated with several charitable and philanthropic organizations to raise funds and awareness for her favorite causes. Nikki and Eric Spoelstra met in the last year of her tenure as a dancer for the Miami Heat. They dated after she had left the team. The couple got engaged in 2015 and were married on July 22, 2016. Fans who want to check out some of Nikki Sapp Spoelstra’s hot pics should head over to her Instagram account right away. It is full of pictures of a pregnant yet stunning Spoelstra! Additionally, you will find plenty of posts of her husband, pets, friends, fashion shows, and her dance students. There are also pictures of exotic landscapes of places the couple has been to, like Africa and safari tours. Right now, Nikki Sapp Spoelstra has her hands full taking care of her baby boy who has brought infinite joy and happiness to the Spoelstra household. Even after going through labor, she still looks like a million bucks! Erik and I are overcome with joy and gratitude over the (early, safe, and super exciting!) arrival of our son, Santiago Ray Spoelstra – Born Sunday, March 25th, 2018 – 6lbs/8oz – 19 inches long. ? With a loving and caring husband like Erik Spoelstra and a heart full of dreams, Nikki Sapp Spoelstra is working hard to add more color and dash to the world! Clearly, she already has!